When it comes to on-highway truck, RV, bus and emergency vehicle service, WE DO IT ALL. Whether you need preventive maintenance or emergency service, we understand your need for bumper-to-bumper vehicle service. Our team of experienced technicians has the diagnostics and tools to make sure your trucks, RVs, buses and emergency vehicles are ready to roll when you are. With three vehicle service centers, we can provide repairs and maintenance for your entire fleet according to the manufacturer’s specifications. Give us a call to find out what we can do for you. Gregory Poole’s three truck and transportation service centers in Garner, Mebane and Fayetteville, NC are home to 25 technicians working in 40 service bays. We have drive-through pits for oil changes, lubrication and other preventative maintenance, and our team can perform service while you wait. 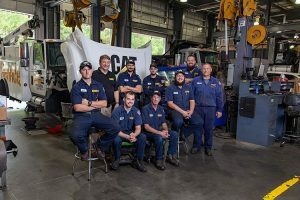 Our technicians can work on any type of on-highway vehicle and have received factory-certified training from Caterpillar®, Blue Bird, Ford and other major vehicle manufacturers. We can perform everything from minor tune-ups to major overhauls of engine and transmission components. We are a certified Federal Highway Administration inspection center, a North Carolina DOT safety and emissions inspection center, and a National Truck Protection inspection and repair center. We have access to one of the largest new parts selections in the country and can fulfill most orders in 24 hours or less. Cost-effective used, aftermarket and remanufactured alternatives are available, as well. For more information about our complete service capabilities, contact Gregory Poole today. If you can’t make it to one of our locations, we can come to you. Avoid expensive tow truck fees with our fast and reliable field service. Our fleet is fully equipped, and our technicians are available around the clock to respond to incidents anywhere in central and eastern North Carolina. One call is all it takes for immediate attention. At our site or yours, Gregory Poole delivers truck and RV service you can count on. To request a quote or schedule a consultation with one of our team members, call or email us today.